Colonial Couple Under Mistletoe, this Norman Rockwell painting, appeared on the cover of The Saturday Evening Post published December 10, 1936. Alternate titles for this painting is just Mistletoe, Under the Mistletoe and Feast for the Traveler. This painting was Rockwell's 171st overall of 322 pictures featured on the cover of The Post. Rockwell's career with the Post spanned 47 years, from his first cover illustration, Boy With Baby Carriage in 1916 to his last, Portrait of John F. Kennedy, in 1963. This was also the ninth Rockwell cover in 1936. The Post featured a Rockwell illustration on its cover nine times in 1936.
on page 134 of Norman Rockwell, A Definitive Catalogue by Laurie Norton Moffatt. It also appears in Covers of the Saturday Evening Post by Jan Cohn on page 162 in color. The original oil on canvas painting was originally given to Col. Russell P. Reeder Jr by Rockwell and is now part of a private collection. It was sold at auction by Sotheby's for $752,000 on December 3, 2009. The original cover price was just five cents, although now a magazine in new condition sometimes sells for over one hundred dollars. 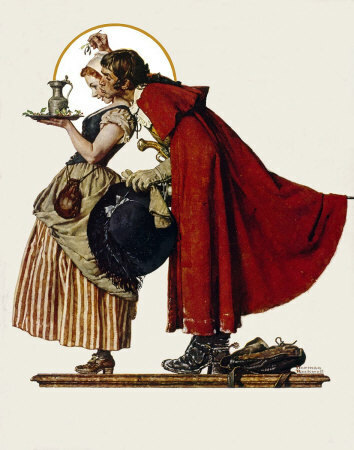 Here is another classic Norman Rockwell Christmas illustration. Christmas is about love. This painting is also about love, albeit a different kind of love. The lady in this painting is just about to go serve whatever is in the pewter vessel. She has the vessel carefully balanced on her tray. The tray is also laden with decorative holly sprigs. Holly sprigs are a Norman Rockwell trademark in Christmas paintings, especially from this period of his work. She has a delighted look on her face. Her suitor has just snuck up behind her with a sprig of mistletoe. Her beau has apparently just arrived. He has dropped his satchel on the floor because he has seen her. He is still dressed in his warm outdoor garb. I love the hat with the large feather stuck in it. His red tunic really makes him look the dandy. His pistol sticking out the front and his sword sticking out the back suggest that he is ready for any dangers the road may present. Colonial Couple Under Mistletoe was only one of 322 Norman Rockwell Saturday Evening Post covers; Here is the list of Norman Rockwell Saturday Evening Post cover illustrations. The bottom of his tunic looks like it has some unmelted snow on it, as do his boots. Another suggestion of the holiday season from the master storyteller of illustration. He harvested some mistletoe on his way to see her. Now it's time to put it to good use. He is puckered and just waiting for her to respond.